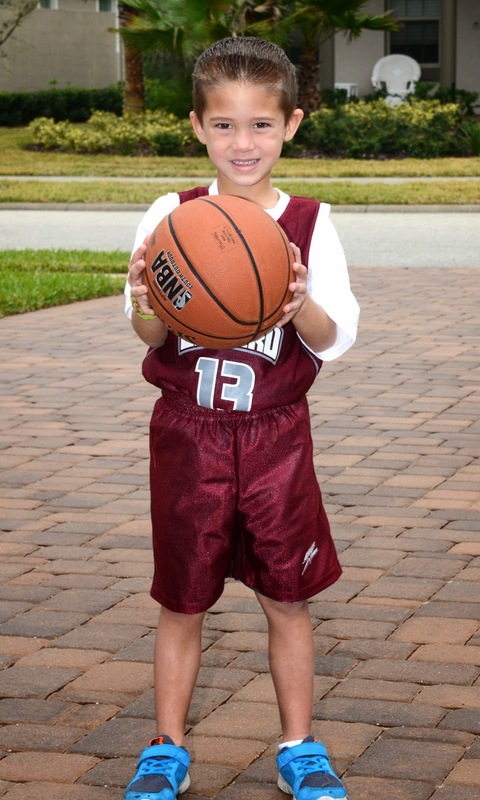 Connor's first basketball game with the Upward Basketball league was this morning at 8am. Basketball practice started back in mid-December and they had a break over the holidays. Today, we got up bright and early, and Connor was pretty tired and wasn't very excited to get out of bed. The Upward Basketball league ran a tight and professional game. The kids all wore armbands and were matched up with players that were assessed with a similar skill level. There were two referees for the game and they did a good job of working with the kids and keeping them following the rules. In Connor's previous league a couple years ago, they didn't let the kids do much on defense and they weren't allowed to steal the ball. In his current league, they are required to wait for the offense to cross mid-court before playing defense, but after that they are allowed to steal the ball and it's a pretty physical game at times. Connor started off the game a little hesitant, but he warmed up eventually and did well when he got the ball. Connor tended to hang back at times, but he did have five opportunities to shoot and made two baskets. After the game, Connor got a star award for being so great on offense.